[Trend] What are the top three trends in recent years about China market, regarding business environment/ regulation, competitive landscape, consumer behaviors, and value chains? How would they re-shape China market and your company’s China strategy in the future? A) The most important trend is the accumulation of vast private wealth in China; and several localized central government experiments to open the door for private capital to invest more easily in China’s private sector; as well as for direct Chinese private capital to invest in foreign assets. It is estimated that 40 percent of China’s capital is in the private sector. Opening Chinese private capital to domestic investment in SMEs’ and large private businesses will strengthen the domestic consumption of Chinese brands vis a vis MNC brands, and increase consumption overall. Neither the MNCs nor SOEs can carry the load of reaching domestic consumption targets. I think these experiments will become general policy, and Xi Jiping will do for SMEs what Deng Xiaoping did two decades ago for attracting foreign investment into the SOE sector through JVs. MNCs will have to compete harder, not only between each other, but now seriously with Chinese SME brands. B) The second trend is the anti-corruption campaign which will reduce the cost of MNC business in China. I think this is serious and long lasting trend. Being in Beijing, I see its effects every day. More officials are being prosecuted for bribery and enriched officials are cutting back on lavish banquets and gifts. This is bad for MNC managed hotels and MNC luxury gifts, but good for the country. This is part of a larger Party initiative to reconstruct a Chinese ethical framework for government conduct in order to mitigate social resentment to government privilege. C) Consumer credit is growing rapidly. China now has the largest number of credit cards in the world. The government must propagandize greater use of this consumer credit. MNC and Chinese brands will benefit. This is the way domestic consumption grew in the U.S., S. Korea, Japan, elsewhere. It has to happen in China. Consumer debt is a faster path to consumption than wage increase, especially in a savings culture like China. It is a general human rule that people are more likely to spend money they do not yet have, than money they already have. [Consumer] With 1.3 billion populations, China is a huge consumer goods market. Mid class income group is taking off. They are young, have growing purchase power, and are getting mature and rational. What should MNCs do to better address such broad but diversified market? A) There are two Chinese markets for MNC consumer goods. The first market is the China mainland itself. Chinese consumer spending is increasing 15% a year, while the U.S. retail market is growing only at rate of 2-3 percent; Europe hardly at all. Therefore, MNC consumer marketing to the Chinese urban middle class is of paramount importance to the global MNC bottom line. The Chinese the middle class is now 25 percent of the urban population and growing. But we have to see this in the context of the ratio of consumption to disposable income. In fact, the ratio of consumption to income is declining. Chinese are inveterate savers because they need money for big tickets items like housing, health, education and retirement…all very expensive propositions due to China’s social underfunding. The biggest challenge facing foreign MNCs on the mainland is to promote spending through compelling branding and credit use persuasion, and to hold their own against the competitive price advantage of Chinese brands. After all, China has a storehouse of its own domestic brands (food, apparel, consumer electronics, appliances, autos, cosmetics, etc.) and the quality, distribution and customer service of these goods and services is constantly improving. Foreign MNC consumer brands are trying to grow their profit by penetrating inland China with low price smaller packages and sub-brands. This higher volume mass market strategy has high distribution, promotional and product adaptation costs; hence, small premiums and higher vulnerability to inflation curves. Lower-end penetration will degrade the MNC brand strength to the middle class in the primary urban markets. B) The second market for MNC consumer brands is off-shore to outbound Chinese tourists and business travelers. China is now the top source of tourism cash in the world. In 2012, 83 million Chinese traveled abroad and spent $102 billion. China will approach 100 million tourists by 2014, and probably double tourism spending by 2020. From January to November 2012, the total retail sales of consumer goods reached 18,683.3 billion Yuan, up by 14.2 percent year-on-year. This is roughly $3 billion + for the year. Let’s assume that MNC brands capture 20% of retails sales, or $600 million. Forgive these imprecise figures, but you see that my main appoint: Chinese outbound tourists and business travelers may be spending more for MNC brands outside of China than inside of China. This gap will increase as travel increases, and the major market for some high-end MNC brands to Chinese purchasers may not be in China, but in New York , Paris, London, Tokyo, Singapore, HK, Milan and wherever Chinese travel. If the future of MNC brand sales to China’s middle class is in their travels, as well as at home, MNCs and their direct or indirect retailers have to facilitate Chinese purchase by greater Union Pay credit card acceptance, and support of partnerships that Union Pay are building with Master Card and Visa. Chinese travelers have more cash in their credit cards than in their pockets. Department stores in London, Paris, Milan and New York are increasingly accepting Union Pay charges. MNC consumer brands must train and facilitate off-shore retailers and online E-commerce systems to accept Chinese credit card purchase and to create the proper ambience for credit card sales. Foreign retail credit financing has to become Sinofied. [Private companies] Emerging local private companies have become threats to MNCs in China and even in global market. Facing increasing cost pressure, most of them are endeavoring to move up along the value chain. What do you think of their growth potential? What’s their innovation capability now and in the future? Do you think copy-cats and Intellectual Property issue will still be a big challenge to MNCs? How can MNCs solve such issues? Chinese outbound investment in technology, distribution and natural resources has reached $68 billion this year and will continue to grow by leaps and bounds. Chinese SOEs and private funds are scouring Germany for machine companies. They are buying financial companies in the UK, fashion firms (apparel, perfume, wineries) in Paris, product design houses in Milan and entertainment chains in the U.S. (Wanda’s acquisition of AMC movie theaters). They are doing this to enhance their own technology and brand strength for the domestic China market, but also to become a new generation of global Chinese MNCs. Huawei and ZTE are good examples. Chinese car export to Europe is increasing and will become a formidable competitor to Fiat and Volkswagen. They will wipe out Ford and GM in Europe. When they come to the U.S. within five years they will give all of the low-end makers a run for their money. China is making impressive innovation gains in bio-technology and electronics. Their own general aviation and commercial regional aircraft is selling domestically and internationally and will grow against foreign MNCs like Lear, Embraer and Bombardier. In five years their single aisle commercial aircraft will compete against the Boeing 737 and Airbus 330. Chinese innovation has already made its global mark in solar and wind energy, as well as other technologies. As for IP in today’s digital cyber world, there is no protection, except costly lawsuits and costly cyber-security. Foreign MNCs should focus more attention on superior business models instead of product protection, courts and Internet security. Also, China is taking IP security more seriously to protect its home-grown innovation. [SOEs] State-owned enterprises (SOEs) are big players in some industries that are regulated. They have support from Chinese government. They have extensive business resources. What’s your view regarding on SOEs’ prospectus? 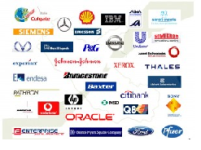 How can MNCs compete more effectively with them? Chinese SOEs are here to stay. They will continue to be consolidated, but with improved management and government support. They are a permanent fixture n the Chinese political and economic landscape. They serve a variety of purposes, chief among which are relatively stable employment for large numbers of workers, a strong tax base, large scale export, and national security, broadly including energy and resource security. Their vast numbers of employees are a key to social harmony. If their employment policy was pure function of free market demand and supply, there would be more unemployment and social unrest than a one-party system could contain. When you can’t throw the bums out of office, as in a democratic multi-party system, the bums have to assure full employment and enough wages for people to live. When China opened the door to foreign investment, joint venture structure was required in practically all industrial sectors. The JV was a receptacle for foreign investment, technology and management know-how. Though the number of these JV sectors has been reduced and are now open to sole ownership of foreign private companies, as well as to ownership by private Chinese companies, the SOEs will remain powerful. As private Chinese companies get larger and need credit, they become closely related to the State banking and political apparatus for credit and government support. The Chinese government has a deep interest in private companies like Huawei, Ping An Insurance, Yutong bus, and other large listed enterprises. Because of their greater management freedom they are better able to compete with foreign MNC and this is in China’s interest. China has global ambitions for its SOEs and large private businesses. If MNCs are joint ventures with SOEs, like Shanghai Automotive and General Motors (SAIC), they are constrained. In fact, as their Chinese SOE partner learns the ropes of management, technology and marketing, they develop their own brands to compete with their JV MNC partner. SGM’s Rowe is a case in point. It will compete with the Buick Regal. MNC management of a joint venture is like walking a tightrope. Foreign MNCs must maintain their place in the China market. To do this, they must be build Chinese official and elite relationships, be a staunch friend of China in their home countries and become, in their own way, Sinofied. In the long run they will have to share the global market with Chinese SOE and large private Chinese MNCs. China has given foreign MNCs two decades of profit in China. Now the Chinese JV partners and large private companies want their two decades of global profit. The foreign MNCs in China will have to help them as strategic allies and investors, and share the global bounty. [Culture and org] Effective intra-communication and mutual understanding play a significant role in the success of MNCs’ global expansion. Have you observed communication difficulties between China team and global team? Where are they mainly from (e.g. strategy development, target setting, implementation of global initiatives, culture conflict)? What are key reasons? What suggestions you want to share to avoid/ solve such issues? Kotler Marketing Group had been operating in China for 13 years. We are an American WOFE serving only Chinese companies; while our American branch serves only Fortune 1000 multinational companies. We have a common marketing consulting brand, but separate client frameworks. Our Chinese subsidiary is entirely separated from the U.S, company in all strategic respects, – business model, management, customers, strategy, offerings and culture. As Chairman of the company, I devoted my entire energies to our China business. My son runs the American branch by his own lights, with no interference from me. We are, in effect, two operating companies under a single legal umbrella: one Chinese; one American. Each branch of the company is exclusively in control of its own performance and resources. I raise this example because the cultural foundation of doing business in China is entirely different than doing business in the West. In effect, we have very little intra-company communication. If we had tried to integrate our two companies in to one management model, we would have failed. In fact, our missions are contrary. 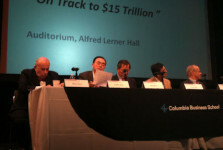 Kotler China helps Chinese company win against western MNCs. Our American company helps Western MNCs win against Chinese competition. Consultancy is a trust business. Our Chinese clients trust that we will serve their global competitive interests; likewise, for our Western clients. Chinese clients cannot trust a company operating in China, but serving the foreign headquarters’ strategy. American clients cannot trust a company serving Chinese interests. The matter goes even further. We have no Americans on our Chinese staff; and no Chinese in our American company. We are separated by language, culture and practice models. The only thing we share is our relationships. Chinese clients value our American and Western customer relations. Our American clients value the fact that we have Chinese relationships. In a world of FDI and ODI the two sides have to do business together; and both sides value consulting companies that have connections and relationship that can be of mutual advantage. This peculiar model is applicable to a service company; while not applicable to an industrial company, which has to transfer investment and productive assets between their different country enterprises and have to respond to global trade demand and supply chains. Global MNCs are inherently inefficient because they have to act at cross purposes. One hand bites the other and; and only a large scale of resources can overcome organizational deficits for a net benefit. A Chinese executive of a Western MNC in mainland China must act with Chinese distributers, suppliers and government regulators in a way that global headquarters can never really understand. Similarly, Chinese executive on the mainland can never really understand what their foreign representatives are doing. While systems can add some consistency, common agreement on decision is impossible and conflicts are inevitable. Micromanagement does not work. In short, there is a cultural and political divide that cannot be merged, only managed to a greater or lesser degree. Different country branches cannot overcome the national political and cultural differences that that they face. The key to MNC global management is political neutrality and cultural pluralism. It is not enough that leadership is diplomatic, because diplomacy is by its very nature unilateral. MNC leadership has to be faultlessly neutral, more like managing a United Nations, than a national interest. I would go one step further and say that MNC corporate leadership must become political indifferent to the fate of nations; while each brand President has to be a patriot of the country in which he is operating. Notwithstanding brilliant models of global management integration propounded by professors, the difficulties of dissonance in communication, strategy, segmentation, targeting and implementation cannot be standardized. [Talent development] Talent development is critical for a company to succeed. How critical is localization of executive teams in China market? What’s current status of such localization? As a foreign executive or a Chinese executive in China, have you confronted big internal communication challenges? As I said earlier, my entire staff in China is Chinese, including my China President and managing partner. Although we are an American WOFE, we operate as a Chinese company serving Chinese clients. We are completely localized, except for my personal visits several times a year and Western expert consultants whom we engage on a project as needed basis. Every time I try to hire an American for our Chinese staff to assist me and upgrade staff skills, it causes confusion and turns sour. So I let my Chinese company evolve in a Chinese way. Our Chinese and U.S. branches are only linked by brand and leadership charisma. No American can run a consulting business in China that serves Chinese clients. Large MNCs face a different situation. Their band and supply chains are global. Cost control and financial investment require expat intervention. But operationally, they have the same problem that I have. An American expat cannot run a large MNC branch or chain of stores in China. There are too many barriers of language, culture and personal relationships. He/she needs Chinese executive leadership. Western MNCs hire Chinese executives and staffs for planning and operations. There is plenty of strategic and management talent among the current and future generations of Chinese professionals. The problem is retention, because they have abundant career opportunities. The key factor for their retention is not salary, which is easily matched elsewhere, but leadership opportunity. Chinese executives in Shanghai and Beijing have comparable life style income value as their peers in New York or London. The only way to retain Chinese talent is to give them more autonomy in China and bring them into responsible positions in global headquarters. In order to do this, foreign MNCs have to change their company culture to welcome Chinese executives and board members. The company culture has to change to make Chinese executives feel comfortable and responsible at headquarters and have a promising executive future in the company. Within the next decade, we will see a new generation of global Chinese MNCs, – Sany, Baidu, Geeley, SAIC, Li-Ning, Vanke, Ping An Bank and Insurance, Yutong Bus, Huawei, ZTE, AVIC International Holdings, Sinopec, CNOOC. Minmetals, and many others. Unless foreign MNCs can change their culture and integrate Chinese talent into their top levels of management, this talent will revert to Chinese MNCs. In summary, the real issue of Chinese talent is not localization of MNCs in China, but globalizing Chinese talent in MNC headquarters leadership, management and control. [China position] Other emerging markets (e.g. Southeast Asian and South American countries) have been developing rapidly in past few years. How is the position of China in your company’s global strategy? Will it change, how and why? Indeed, there are many business opportunities throughout the developing world. Where and how to grow your business is a strategic decision, based on resources, competencies, financial targets, and other factors. 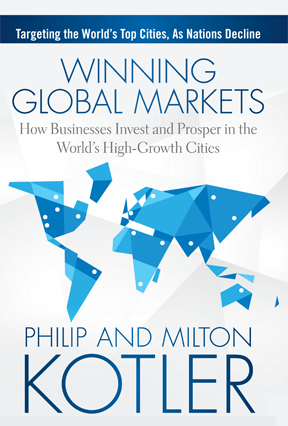 As a small global consulting company, Kotler Marketing Group has no plan to expand beyond the U.S. and China. These are the two great powers of the world and China has another 30 percent of its population to urbanize by 2030. That means astonishing growth opportunities in China. China is enough for us. In fact, if I had to make a decision to close an office, I would choose to close our U.S. office. While China continues to grow it will take another decade, at least, for the U.S. to deleverage and double its population, if it’s smart, for real demand growth; and the EU two decades. Large MNCs face another problem. As listed companies, they seek short term profits and must exploit the initial opportunities to make money in new developing markets. The consequence of this short term urgency for quarterly money will be their weakened penetration and a long term disadvantage in China, or any other large developing market, like India, Indonesia, Brazil, etc. By the time they skim off the cream of new markets, they will forfeit their market position in China to Chinese MNCs and in China’s focused investment target markets in Africa, Latin America, and elsewhere. They will also lose market share in the U.S. when Chinese autos enter the U.S. market. See the case of solar energy. It is a mark of great business leadership not to spread yourself too thin, and to focus growth on stable and large demographic markets. Invite Chinese investment to developed markets and share market control. [E-commerce] E-commerce has dramatically changed people’s lifestyle in China. Do Chinese consumers have any unique on-line shopping behaviors that are different from those of developed countries? To MNCs, is e-commerce more of an opportunity or a challenge? E-commerce in China is growing at the fastest rate in the world. Chinese shoppers are scrupulous consumer investigators. They use the Internet to investigate products. The more you explain your offering on-line, the better off you will be. They are still great savers and hesitate to make spending decisions, especially to remote digital destinations. You need more incentives to get them to purchase on-line. You must have their trust, so branding, PR, local physical presence, great customer service and corporate social responsibility are imperative. [Others] From an MNC’s perspective, do you see any big challenges that we have not covered today? The biggest question about MNCs that you have not mentioned is their social and moral responsibility. People throughout the world have little confidence in governments and politicians to meet their needs. They are more loyal to great brands than they are to politicians. It is the MNCs, not governments, than can harmonize world differences and keep us from war. We must discuss the moral responsibilities of the vast wealth and trust that great MNCs have throughout the world. Their leaders must speak up on divisive political and social issues of our times, like income disparity, injustice, corruption, educational privilege…..not just global warming. MNCs must play a role in harmonizing society. [Key takeaways] What is the key learning from your working experience in China? What you wish you would have known at the very beginning and have done differently? A) To do business effectively in China, an American must become a serious and persistent student of Chinese history, language, moral culture and aesthetics…not just business practice. B) Find a way to become a friend of China, before you come to China; and stay a friend. C) Since my business in China was an accident of my service to classical music, there is nothing that I could have done differently. It was music, not business, that got me to China. But that is long story for another day. D) Fortunately, we already had a great brand among China’s industry leaders and managers before I came to China. They read the early Chinese translation (Singapore) of Philip Kotler’s Marketing Management, at the time Deng Xiaoping opened China to a market economy with Chinese characteristics. E) Finally, luck is the mother of good fortune. I was lucky to have a splendid brother Philip to advise me along the way and to visit us in China to meet his fans. 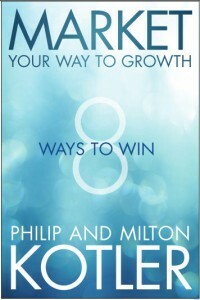 Philip has no ownership in Kotler Marketing Group. I was also lucky to have a trusted and brilliant young Chinese employee and now partner, Cao Hu, who has grown to manage our business for the past 12 years. You cannot command luck to come; but you can invite it by your mastery of knowledge and seriousness; and welcome it, if it comes.